Our range of products include motor starter control panel, single phase mcb pump control panel and single phase electronic pump control panels. 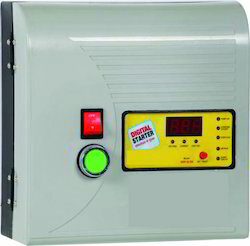 We have gained the remarkable position in the market as one of the leading providers of Motor Starter Control Panel to our esteemed customers. The offered product is designed under the supervision of our adroit professionals using high quality material with the help of modern techniques. The offered product is widely demanded by our customers and is available at reasonable cost. Electronic starter up to 2 hp. Starting capacitor cutoff timer (CCT) to protect start capacitor in the panel and Starting winding of pump from high discharge current. Site selectable dry run trip setting from 75 to 95 % of set pump current. 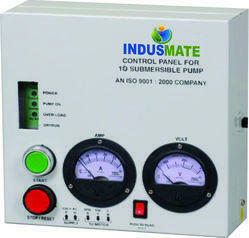 "Site selectable pump current setting from 2-16 amps. ( or as required )"
Voltmeter and Ammeter to know site voltage and current at a site. Starting and running capacitors as per pump requirements. Widest working voltage ranges from 140 to 300 volts. Specially made heavy duty air sealed 40 amps dc coil contactor for long life & to withstand high inrush current & spikes up to 100amps. Price Range 1500 To 50000 Rs. With the help of diligent and adept professionals, we have been able to offer our clients a qualitative range of Single Phase MCB Pump Control Panel . Our provided panel is available in different models as per the requirements of our clients. Offered panel is designed and manufactured using high grade. We offer Single Phase Electronic Pump Control Panels, which are designed using latest technology and advanced machinery. These panels are widely used in domestic and industrial sectors. We use top grade compounds to design these control panels. Our offered range is precisely tested by our team of quality analysts to ensure flawlessness. We are a noteworthy organization in this domain, occupied in providing a pristine quality range of Single Phase Control Panel. At our vendors' well-maintained production unit, this panel is manufactured using the superior grade components and developed technology.